Will Lyman and Karen MacDonald channel the doomed Tyrones. Photos: Andrew Brilliant. I confess I'm on the fence about the New Rep's current version of Eugene O'Neill's Long Day's Journey into Night. It's hardly a great production of this difficult (though deeply rewarding) play - it features several of Boston's best actors, but they're slightly miscast, and the direction, by Scott Edmiston, isn't up to the demands of the text. Nevertheless, it's not a bad production, either; I doubted Edmiston could handle O'Neill's thorniest tragedy - and I count myself vindicated - but he did do better than I thought he would. 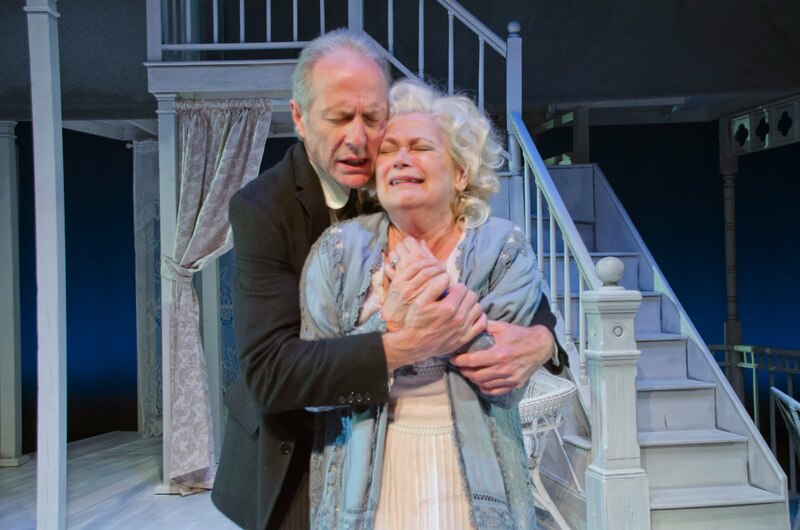 And his leads, Will Lyman and the great Karen MacDonald, have moments of piercing intensity and insight (as above) in two of the greatest roles O'Neill ever created, James Tyrone and his doomed wife Mary (who were modeled on O'Neill's own tormented, emotionally dishonest parents). Thus, if you've never seen this drama, what I call the "Vanya on 42nd Street" effect may pay off for you; there's enough raw power here, in sporadic bursts, to allow the uninitiated to sense the intensity of the play. If you're an O'Neill aficionado, I doubt you'll be as impressed - even though I don't quite count myself as one. I've taken a half-dozen Journeys - one of which was unforgettable - and in the end, I'd probably rate this almost precisely at the middle of the pack; it's certainly better than the boring Katharine Hepburn movie (or the disaster at the A.R.T. back in the nineties); and it's slightly better overall than the Gloucester Stage version some five years ago (although Sandra Shipley in that production was the best Mary Tyrone I've ever seen). And thankfully Edmiston has mostly reined in his penchant for tidying up the script - mostly, that is; but he's still underlining things with his virtual directorial highlighter. Janie E. Howland's set is heavy-handedly metaphoric, for instance; it's a pale ghost of a real house (everybody's haunted, get it? ), and there are spooky sound-effects here and there that are sometimes a bit much; yes, it's all pretty clever, but it's also a little too pretty; we're aware of the design when we shouldn't be. Still, the set does allow for one genuinely evocative bit of stage business, in which Mary, lost in a fog of morphine, passes like a blur back and forth behind a frosted door. But on second thought, transforming young Edmund Tyrone literally into Eugene O'Neill - mustache and all - is, well, far too obvious (we know this script is autobiographical, we've read the program). So if you tallied up the wins and misses here, you might come to a draw; compared with Edmiston's various sins against authors in the past, though, I suppose you could count all these directorial flourishes as relatively minor. But what Long Day's Journey inevitably highlights, I'm afraid, is that beneath his decorative skills, Edmiston is simply too superficial for O'Neill. He arranges the play quite well, I admit; actors are set up for their solos, the pacing slows here and there but never quite comes to a stop, and the blocking is well-balanced, etc. - still, no sense of real ensemble develops over the course of the production. And this is because Edmiston hasn't really dug into the play and worked out a coordinated emotional vision for the actors. And that's what Long Day's Journey Into Night is all about; it's a tragic web, in which the usual "lead" is replaced by an entire family, operating as both hero and accusatory chorus. The Tyrones are in sad shape - patriarch James is at the tail-end of a matinee-idol career which brought him riches but never cured him of his innate cheapness, or his inability to actually connect with other people. Only now, in the twilight of his life, is he realizing that his sons are both wrecks, and that his wife is - well, Mary is slipping back into the morphine addiction she developed when a hack doctor (the only one her husband would pay for) prescribed the drug for her as a painkiller. Lewis Wheeler does his best to hate Nicholas Dillenburg. What's more, she's backsliding largely because she can't face the fact that her youngest, Edmund, may himself be slipping into tuberculosis (an added twist of the knife comes from the fact that it was Edmund's birth that first pushed Mary to seek pain relief). Meanwhile elder brother Jamie surveys the deepening collapse around him with a cynical scowl - that is when he's not drowning his self-hatred in booze, brooding on his personal failures, or indulging in jealousy of his younger brother (another infant - tellingly called "Eugene" - died of measles contracted from, yes, Jamie; the real Eugene O'Neill had a baby brother named Edmund who died in the same way). Whew. Are we having fun yet? Well, while I can't pretend that Long Day's Journey is a grand night out, I can argue that it is great art - one of the greatest portraits of familial dysfunction in literature, in fact. And what makes it all the more piercing is that O'Neill understood above all that deep, familial ties are bent, but rarely broken, by betrayal and disappointment; yes, despite the tangled skein of their mutual guilt, the Tyrones still love each other, which makes the poignance of their predicament all but unbearable. Needless to say, limning this lattice of recrimination and loyalty requires a strategy, but Edmiston doesn't seem to have one, so you keep feeling that the actors are largely doing their best on their own. 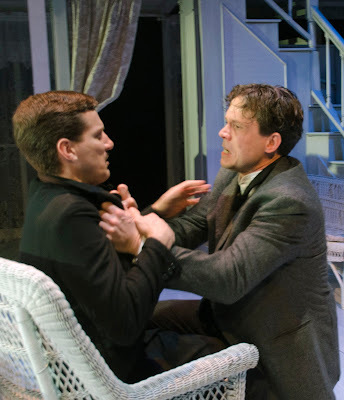 MacDonald and Lyman have worked together before, of course (in the by-now-legendary production of All My Sons at the Huntington), so they trust each other, and sometimes connect at the level O'Neill intends. But they're actually reversed in terms of type - MacDonald has the broader, louder presence of a possible matinee idol, while Lyman often has an aura of elegant introspection, so their relationship never quite has the deep resonance it should. Still, Lyman is sometimes touchingly puzzled, and MacDonald simulates porcelain as best she can, and in fact is often riveting (she knows all the notes she should hit) - the performance is just slightly scattershot; and we don't feel that at bottom Mary is essentially deceptive, as we really should. But then we don't feel that about anyone; what used to be called 'actor intent' is largely missing from this production, even though everybody in Long Day's Journey is basically attempting to deceive someone (or everyone). And this means that Edmiston has missed the motor of the play, which is why the production slowly begins to drift, and makes you feel every minute of its three-and-a-half-hour running time (a hint to future directors of O'Neill: shave ten minutes off the second act of this baby). The gap is most apparent in the performances of the troubled Tyrone siblings; as Jamie, Lewis Wheeler actually has the only fully-worked-out portrayal to be found in the cast, but at least as of opening night it was still an intellectual exercise; he hadn't internalized it yet. To be fair, this may have been partly due to the fact that as Edmund, newcomer Nicholas Dillenburg was a handsome blank, so Wheeler didn't have anything to work against. Edmund often seems to be the weak point of this script; the role, I think, is underwritten, perhaps because the other characters are largely seen from his vantage point; still, there's much for Dillenburg to play that he hasn't yet figured out - most importantly, his own efforts to hide his deteriorating health, and not face the terrible moment in which he must see that his own mother (like his father!) is unavailable to him in his time of need. Still, all things considered - if you've never had any contact with this play, you should probably see this production. It is a worthy introduction to this dramatist, if not too much more. And at the very least, in Karen MacDonald's performance you will sometimes see the muse of tragedy peek out from behind her mask; and in these slick, superficial days, that's something to treasure.